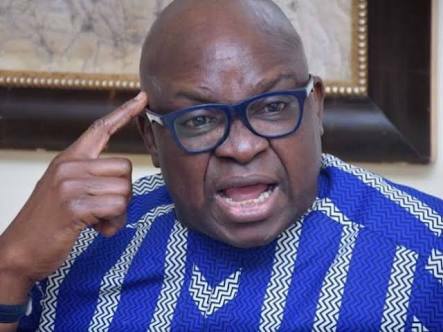 Ekiti State Governor Ayo Fayose yesterday accused the Federal Government of blocking the gate of the Ekiti State Government House with security forces. Drivers’ union members had dropped their vehicles at the Government House, as directed by Fayose on Monday night where an all-night party held till Tuesday despite the heavy deployment of security men. But pedestrians were allowed to go in with many going to join the Ekiti drivers unions who assembled at the government house since Monday night. A musician was on the band stand to entertain the commercial drivers and Peoples Democratic Party (PDP) members on ground. Fayose also mocked the APC final rally held same day, accusing the party of importing outsiders from neighbouring states to fill the stadium. Addressing the crowd at the party, Fayose criticised the Federal Government for blocking the gates of the Government House with battle-ready riot policemen. The Ekiti governor described the development as “an abnormality”. He thanked his supporters for shaming the APC-led Federal Government by appearing at the Government House, despite the security presence. He said the presence of the crowd had proved to the APC that the masses were for him. Leaders of National Union of Road Transport Workers (NURTW), Road Transport Employees Association of Nigeria (RTEAN) and Pickup and Lorry drivers Association of Nigeria (PLAN) and Okada Riders Association vowed to vote for the PDP candidate, Prof. Kolapo Olusola, in Saturday’s governorship election. Fayose said: “It is an abnormality to block the gates of the Government House. “If they say I gave instruction to drivers unions to withdraw their services, let the APC give a counter-instruction to them, if they are popular. “They (security agencies) blocked gates of the Government House, because they don’t want people to come in. But, you shamed them by still coming. “They brought them from Ondo, Kogi, Osun and other neighbouring states; they are all foreigners. They have no voting strength. Fayose also berated the APC National Chairman, Comrade Adams Oshiomhole, for questioning the PhD degree of Olusola at the party’s mega rally in Ado-Ekiti. He advised Oshiomhole to ask the President to tender his certificate to Nigeria first before he could raise an issue about others.